← Preschool lessons: New research shows that teaching kids more and more, at ever-younger ages, may backfire. When I saw this book at our favorite neighbourhood bookstore, I fell in love with it’s title and its cover design – it projected a very novel and innocent approach to a subject that often eludes us – how to be happy. The writer did not take on this book project because she was unhappy, and I did not buy the book because I wanted to “find” happiness. I was curious how she approached the subject and her project. And here’s how she did it – month by month, a target was assigned. She is writing from her own personal experience as a writer, a wife and a mother of two kids. From her writings, one identifies with some of them, and in the process, visualizes the changes needed to boost one’s happiness in certain areas. Her tips are thoughtful and helpful, and she quotes research facts in every other sentence that she writes. This is intended to prove to the readers that she is not merely saying it because of what she thinks is right, but they are backed by research findings of specialists and experts. She also runs a Happiness Project blog and often asks her readers to write in to share their opinions on certain topics. These are included in the book to give a wider perspective to the topics discussed. Many of the “advice” and suggestions given here are quite simple and straightforward. Sometimes you wonder why you need to pay good money to be told the obvious! But then, many of us are so busily carried away with our daily problems that we often overlook the simple solutions to everyday happiness. So just reading a book like “The Happiness Project” can boost one’s happiness levels just by having one’s problems brought to the needed perspective. And it aptly ends with a chapter titled “Your Happiness Project” so that the reader is proactive about her own happiness by dwelling on some important questions related to happiness (and the lack of it) and useful strategies to achieve one’s happiness goals. 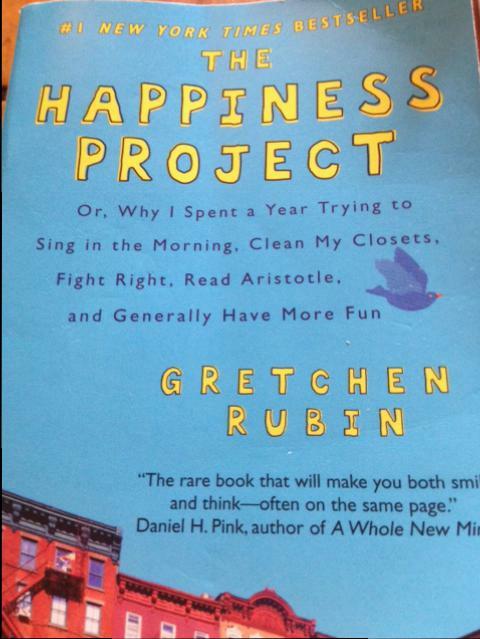 My only “problem” with this book is that it sounds too happy and chirpy to be taken as seriously as I would like to! This is just my personal opinion – don’t be swayed by it. I get a little uncomfortable with people who seem super chirpy and super organized! So I skip the chapters that sound too obvious to me and go for those that bring new ideas and new perspective that I may have overlooked. All in all, a nice book to add to your “personal development” collection.